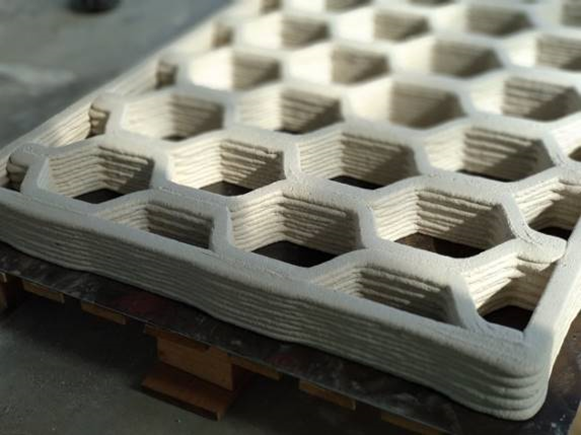 3DCONS, a Spanish construction consortium, has completed a collaborative 3D printing research and development project aimed at developing innovative 3D printing systems and materials for construction. The consortium, led by Spanish construction company VIAS Y CONSTRUCCIONES, has been working on the project for over three years, and presented the results of the project at the Institute of Construction Sciences Eduardo Torroja (IETCC) in Madrid. With the developments presented as part of the project, 3DCONS hopes it will enable the future automation of building construction, rehabilitation and thermal insulation with 3D printing. One of the 3D printing systems developed by 3DCONS in action. Image via Atanga. The construction research project relied on financing of over eight million euros, and was funded by the Center for Industrial Technological Development (CDTI), a public organization for technology development in Spain. The funding was part of the STRATEGIC CIEN, a program that finances large industrial research and experimental development projects with contribution from the European Regional Development Fund (ERDF). As well as VIAS, members of the consortium include Spanish material, construction, manufacturing and software companies LafargeHolcim, Saint-Gobain Placo, GEOCISA, PROINGESA, ATANGA and CYPE. One of the 3D printing systems developed as part of the 3DCONS project. Image via Atanga.